Cyclist's move comes a week after the U.S. Anti-Doping Agency released a massive report detailing allegations of widespread performance-enhancing drug use by Armstrong and his teams. 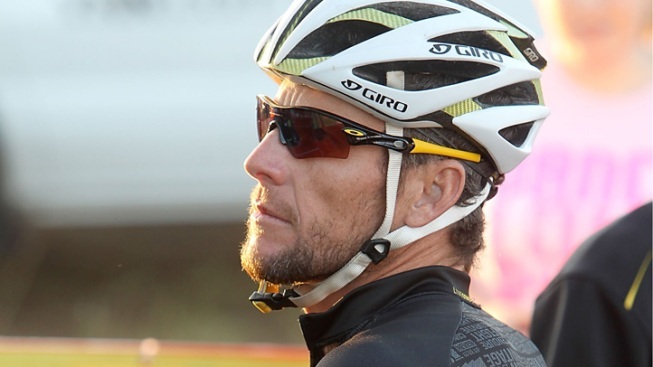 Lance Armstrong is stepping down as chairman of Livestrong. Already an outcast in cycling after a massive doping report, Lance Armstrong absorbed hits much closer to home Wednesday: to his wallet and his heart. Armstrong was dumped by Nike, Anheuser-Busch and other sponsors, and he gave up the top spot at Livestrong, his beloved cancer-fighting charity, a week after an anti-doping agency released evidence of drug use by the seven-time Tour de France winner. Armstrong stepped down as chairman of Livestrong in an attempt to minimize the damage caused by the U.S. Anti-Doping Agency's report. USADA banned Armstrong from the sport for life and has ordered that his Tour titles be stripped, which could come before the end of the month. "This organization, its mission and its supporters are incredibly dear to my heart," the cancer survivor said in a statement. "Today therefore, to spare the foundation any negative effects as a result of controversy surrounding my cycling career, I will conclude my chairmanship." Minutes later, Nike dropped its personal sponsorship contract with him and issued a blistering statement that the company had been duped by his denials over the years. "Due to the seemingly insurmountable evidence that Lance Armstrong participated in doping and misled Nike for more than a decade, it is with great sadness that we have terminated our contract with him. Nike does not condone the use of illegal performance enhancing drugs in any manner," the company said. In 2001, the apparel company produced an anti-doping commercial, narrated by Armstrong, addressing allegations that he had used performance-enhancing drugs by mocking the question, "What am I on?" and answering that he trained on his bicycle "six hours a day." Brewing giant Anheuser-Busch followed Nike's lead, saying: "We have decided not to renew our relationship with Lance Armstrong when our current contract expires at the end of 2012." Soon after, other sponsors also cut ties with him. Among them were Trek bicycles and Honey Stinger, a maker of foods and gels for athletes. "We are in the process of removing Lance Armstrong's image and endorsement from our product packaging," a Honey Stinger spokesman said. An image of Armstrong's signature that was on the site's front page earlier in the day appeared to be gone late Wednesday. The FRS Co., which makes energy, diet and health drinks, said Armstrong had resigned from its board. If there was a silver lining in the day for Armstrong, it was that his major sponsors said they will continue to support the charity, which started as the Lance Armstrong Foundation 15 years ago. Another longtime sponsor, sportswear maker Oakley, said it is withholding a decision until the International Cycling Union — the governing body for cycling — decides if it will fight USADA's sanctions against Armstrong. UCI has until Oct. 31 to appeal USADA's sanctions against Armstrong to the world Court of Arbitration for Sport. If not, the penalties will stand. Armstrong, who Forbes has estimated is worth about $125 million, was not paid a salary as Livestrong chairman and will remain on the charity's 15-member board. The duties of leading the board will be turned over to vice chairman Jeff Garvey, who was founding chairman in 1997. Garvey will be responsible for big-picture strategic planning and will assume some of the public appearances and meetings that Armstrong used to handle. At the entrance to the Livestrong headquarters in Austin, autographed framed yellow jerseys from each tour win are mounted on a wall near the entrance. Armstrong had a conference call with employees on Wednesday to explain his decision. "I've been better and I've been worse," Livestrong President and CEO Doug Ulman quoted Armstrong as telling employees when asked how he was feeling. Armstrong denies doping despite USADA's report, intended to explain its decision in August to punish Armstrong. He claims to have passed hundreds of drug tests but chose not to fight USADA in one of the agency's arbitration hearings, saying the process was biased against him. Crisis management experts say the denials aren't enough to mitigate damage to Livestrong. Gene Grabowski, executive vice president of Levick, a Washington, D.C.-based crisis and issues management firm, called Armstrong's move a good one for the foundation. "It helps take the bull's-eye off the chairman's back," Grabowski said. "It enables the charity to show it is taking the situation seriously. It probably won't satisfy everyone, but it will satisfy a good number of people. It's a step he had to take." Kelly O'Keefe, professor of brand strategy at Virginia Commonwealth University, said it may be too late to completely salvage Livestrong's reputation. And Armstrong may never be able to fully resume his public role with the group, he said. "From the brand perspective, Armstrong is done," O'Keefe said. Unlike Tiger Woods and Michael Vick, athletes who also were embroiled in off-the-field scandals, Armstrong is tainted by charges of cheating in his sport, not transgressions in his personal life. After time away, Woods and Vick could return to the playing field to help redeem their public image. "Armstrong doesn't have that. He's just a retired athlete with a tarnished image," O'Keefe said. Nike's statement was notable both for the sudden decision to abandon him and the tone condemning an athlete it had strongly supported just a few days earlier. Armstrong tweeted earlier this month about a visit to Nike headquarters in Oregon. The USADA report also had the disadvantage for Nike of putting previous allegations back in the spotlight, such as a claim from a 2006 lawsuit deposition given by Kathy LeMond, wife of Tour winner Greg LeMond, in which she accused Nike of paying cycling's international governing body to cover up a positive Armstrong drug test. Nike has denied the claim. Other cancer organizations lauded Armstrong as an advocate in the fight against the disease. "Armstrong has been a world leader in addressing the physical and emotional challenges that cancer patients face, both during and after treatment. He has personally campaigned tirelessly for increases in cancer research funding. He and this foundation have also been advocates for better access to quality cancer care — for all people," said Dr. Larry Shulman, director of Dana-Farber Cancer Institute in Boston. Armstrong's inspiring story of not only recovering from testicular cancer that had spread to his lungs and brain but then winning the world's best-known bike race helped his foundation grow from a small operation in Texas into one of the most popular charities in the country. Armstrong drew legions of fans — and donations — and insisted he was drug-free at a time when doping was rampant in professional cycling. In 2004, the foundation introduced the yellow "Livestrong" bracelets, selling more than 80 million and creating a global symbol for cancer awareness and survival. "As my cancer treatment was drawing to an end, I created a foundation to serve people affected by cancer. It has been a great privilege to help grow it from a dream into an organization that today has served 2.5 million people and helped spur a cultural shift in how the world views cancer survivors," Armstrong said in his statement. A spokesman declined comment on Nike ending its releationship with him. Ulman had said last week that Armstrong's leadership role would not change. Armstrong's statement said he would remain a visible advocate for cancer issues, and was planning to speak at Friday night's 15th anniversary gala for Livestrong in Austin.